Someone somewhere needs to make the obvious “Notwithstanding Claus” joke this election seasion. Ho ho ho! Merry Election! But on the other hand, this is Disney. This is less about stepping back into the 100 acre wood to reimagine it and more about wringing some more cash out of a classic. Reducing Pooh to its market value makes my blood turn cold. But it makes me wonder: why replace Christopher Robin? What would a tomboy bring to this new audience that Christopher Robin couldn’t? He wasn’t a particularly masculine little boy, after all. He was a gentle little soul, not particularly exclusionary. Obviously this is less about being creative and more about repackaging something that sells to see if it will sell more. But the entire process rests on an interesting point; companies hate it when fans take possession of a character or universe and produce new stories featuring it, and often push forward the ‘integrity’ argument (something Anne Rice clings to). 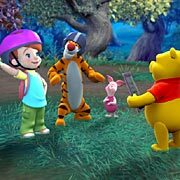 Interesting how corporate-driven fanfiction, which is what this Tomboy-girl thing is for Winnie-the-Pooh, is just fine to them. And so Christopher Robin began to run, first one way and then the next, looking for a tree or steam or path he knew, so he could find his way to his friends. He called out to them — “Pooh! Piglet! Tigger! Rabbit! Owl! — but none answered, or if they did Christopher Robin did not hear them. From time to time, however, it seemed to Christopher Robin that he could hear them, just over a small rise, all his friend’s voices, and a new voice he did not know. But when he ran that way he found nothing, just more trees and more leaves. And so Christopher Robin lay down in the leaves and went to sleep, shivering only a little, trusting in the love of his friends to find him and bring him home.